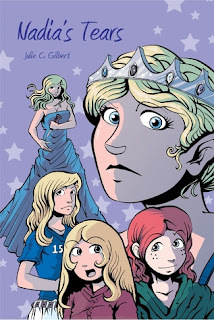 Jillian must enter Nadia's dreams to wake her from a mysterious coma. In Nadia's dreams, Jillian meets several versions of her sister, including the elegant Queen Elena, fierce Naidine, and heartbroken Nadie. Meanwhile, Danielle must save her friend Christy from making choices that could get them both killed. I enjoyed this book even more than the first one. In Nadia's Tears, we learn more about Devya's Children, especially Nadia. She's certainly the most interesting of the children, in my opinion. Her gifts vary widely and seem to have little to no limits. And while Nadia is certainly my favorite, Malia (another key character in this book) is a very close second. While I'd like to learn more about all of Devya's Children (they are fascinating to me! ), I'm curious to learn more about her especially. As far as the story goes, I was a bit confused in the beginning about how Danielle and her friend, Christy, would relate to the story. Of course, it all came together perfectly and really added another dynamic to the story. While giving away no spoilers, I enjoyed the heavier, serious issues in the book. Though they weren't delved into too deeply, I enjoyed seeing the topics here. Bringing attention to those things was done well here. Seeing Devya's Children work together to save Danielle and Christy and bring a bit of justice into the world was great. To top it all off, I enjoyed the way the book ended. It allows for future books without a cliffhanger.